This degree provides a unique focus on works of art as physical objects. You will gain comprehensive skills in art history, together with a thorough understanding of artists' techniques and questions of materiality and technology, both at the time a work of art was made, and subsequently as it ages and deteriorates. No specific subjects, though essay-based subjects are an advantage. English Language at grade B or 6, plus Mathematics at grade C or 5. For UK-based students a foreign language at grade B or 6 is required. Pass in Access to HE Diploma, with 23 credits awarded with distinction in the Level 3 units, the remainder of the Level 3 units with Merit. AAA at Advanced Highers (or AA at Advanced Higher and AAA at Higher). High-quality research undertaken by staff, which is reflected in our research excellence profile, informs the content of our undergraduate degrees, keeping our teaching at the forefront of the discipline. The department includes well-known specialists on all periods from the medieval onwards. We have particular strengths in the study of contemporary art, material science, and conservation theory and practice. The department houses the Material Studies Laboratory, consisting of two spaces, one dedicated to teaching and handling materials and artefacts, with the second focusing on the instrumental analysis of heritage materials. UCL's central location in London is within walking distance of the British Museum and British Library and provides easy access to the National Gallery, the Tate galleries and the Victoria and Albert Museum. The programme begins with introductory modules in History of Art and its Objects and foundation modules in history of art, together with a thematic seminar. You will also take modules in art and science and media and technologies. These modules will introduce the major classes of materials, media and technologies found within public and private collections, and address their application as artists' materials. Modules in the second year delve deeper into the technical aspects of art. These may include the History and Theory of Conservation; and Textile Technologies. In the final year, all students write a research project dissertation of approximately 10,000 words. This may have a technical element, combined with art historical research. The Art/Work/Space module enables you to gain practical work experience outside the department while writing an independent research project reflecting critically on this experience. You may also take modules from outside History of Art in departments such as Anthropology, Archaeology, Architecture, Chemistry, Earth Sciences, History or Philosophy, with the agreement of the department concerned and your programme tutors. Students must also take a in a modern foreign language, preferably in the first year. Further optional modules can be selected from within History of Art. You will select 90 credits from a wide range of options including Art/Work/Space and at least one Special Subject. Further options can be selected from within History of Art. It is also possible to select options from fields such as anthropology, archaeology, chemistry, earth sciences, history or philosophy, with the agreement of the department concerned and your programme tutors. There is also the option to continue with a language (non-beginners only). The programme is delivered through a combination of lectures and seminars, and may include visits to monuments, film archives and sessions in the Material Studies Laboratory. Seminars may relate to a lecture series and involve travel within the UK or abroad. On a more frequent basis, first-year thematic seminars take place at London's many art collections and exhibitions. Coursework, essays, oral participation and written examinations will all be used as means of formal assessment of your work. 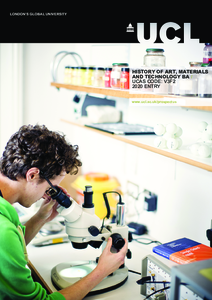 Detailed course descriptions are available on the department website: History of Art, Materials and Technology BA. You will gain the skills necessary to carry out historical and technical projects, communicate effectively, interpret material analysis, and to pursue academic research or take up responsible employment in a variety of contexts. This BA provides an excellent basis for any career dealing at first hand with works of art, such as museum and gallery professionals, art dealers, valuers and auctioneers. It is also a good foundation for those wishing to take up further training in any specialism within art conservation. Any profession dealing with art would benefit from the expertise gained from this degree. Students are expected to pay the entrance fee to any admission-charging exhibition or museum visited by a class; the tutor will usually negotiate a group discount where this is significantly cheaper than the individual student discount. We welcome applicants who have a serious interest in, and enthusiasm for, the study of art history. Entry is highly competitive, but you will not be required to have studied history of art before. However, advanced study in an essay-based subject such as history or English, as well as a language, would be an advantage. Applicants will be assessed not only on academic achievement, but on evidence of intellectual curiosity, and of critical appreciation of visual and material culture. If we are considering making you an offer you will be asked to complete a short written exercise, and then invited to the department on an open day to meet the teaching staff and learn more about the degree programme.